Home » Blog » Conquer dry, winter skin! #1) Adjust your bathing routine. Next, adjust your body cleanser. If you are experiencing any sort of itchiness, caused by the winter weather, ditch that bar soap and switch to a hydrating cream cleanser. Look for soothing ingredients in your body wash such as shea butter, milk, aloe or oats and stay away from heavy fragrance. The last and most important step is to make sure you moisturize immediately after toweling off. Moisturizers are designed to lock in moisture and will help retain the moisture in your skin from the bath, if you apply straight away. #2) Change up your face cleanser. Comforting Cleansing Milk (Guinot): cleanses and removes makeup gently without disturbing the skin’s natural pH balance. Containing fig extract and shea oil, this cleasner, with its creamy milk texture, soothes tightness and dryness, softens the skin, soothes, comforts, and calms the skin. Ultra-Calming Cleanser (Dermalogica): gentle cleansing gel/cream for reactive skin. This PH-balanced, non-foaming cleanser helps calm and cool reactive, sensitized or over processed skin. It delicately fortifies the skin’s protective barrier within leaving an irritating residue. #3) Moisturize, always and often. Moisturizing is simple, yet critical in the winter months. When choosing a moisturizer, make sure you are looking for ingredients that will help retain moisture and one that is suited to your unique skin type. Key ingredients, such as hyaluronic acid (which holds 1000x its weight in water), are incredibly powerful toward combating dry skin. Dermalogica’s Intensive Moisture Balance is our top pick in the winter, as it strengthens the skin’s lipid barrier and intensely moisturized dry, depleted skin. 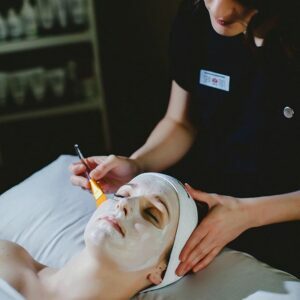 If you have a skincare questions, or need help choosing the right products for your skin, we offer free 15 minute skin consultations at Spa 901. Our team of skin care specialists is here to help!